To create new templates, the ResumeFodder-templates repository is the only one you need to clone. See the "Creating Templates" section of the documentation for more detail. 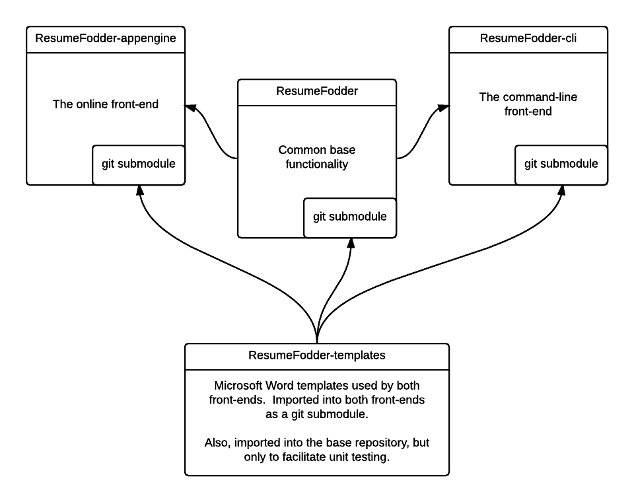 ResumeFodder is essentially "feature complete" for the time being. There are no immediate plans to add new functionality to the core processor or its front-ends. If you have a proposal for new functionality, please create an issue ticket to discuss it. If you find a bug in ResumeFodder, then GitLab is the preferred collaboration platform for merge requests, but pull requests may be issued to the GitHub mirror also. Either way, it is best to create an issue ticket first before writing the code change. If you would like to author a new template for ResumeFodder, then this is VERY welcomed! See the "Creating Templates" section of the documentation for more detail. If you are not comfortable adding the Go template dynamic tags yourself, then you are still encouraged to submit a resume with static text in Microsoft Word 2003 XML format. Note that ResumeFodder is made available under the MIT License. By making any contribution, you acknowledge that the MIT License will apply to it as well.